The Kościuszko Chair was named after a truly remarkable man. Tadeusz Andrzej Bonawentura Kościuszko was born February 4, 1746, in the village of Mereczowszczyzna (now Kosava, Belarus), in the Grand Duchy of Lithuania, a part of the Commonwealth of Poland-Lithuania. A member of the Polish nobility, Kościuszko decided upon a career in the military. He enrolled in the newly formed Szkoła Rycerska (Academy of Chivalry), a school created by King Stanislaw II to train a well educated cadre of officers and state officials. There, Kościuszko received a classical liberal arts education, studying, apart from the strictly military subjects, Polish and world history, philosophy, Latin, German, French, law, economics, geography, arithmetic, geometry, and engineering. Upon graduating in 1765 with the rank of Captain, Kościuszko was granted a royal scholarship and departed for Paris. He spent the next four years studying military engineering and absorbing pre-revolutionary France. Kościuszko returned to Poland in 1774, but his time in Paris would prove tremendously influential over the course of his life. Kościuszko came home to a very different Poland. In 1772, Prussia, Russia, and Austria had completed the first partition of the Polish-Lithuanian Commonwealth. Taking advantage of Polish exhaustion from the anti-Russian insurrectionary Confederation of Bar, this troika of empires succeeded in annexing over 30 percent of Commonwealth territory. Poland was also forced to reduce its army to 10,000 soldiers, and Kościuszko did not stay long as a result. He made his way back to Paris, where he was recruited by Silas Deane and Benjamin Franklin to fight for the fledgling American cause against England. Stop, Doctor, let us be honest. In war, as in medicine, natural causes not under our control do much. In my case, the great tacticians of the campaign were hills and forests, which a young Polish engineer was skillful enough to select for my encampments. During his time in America, Kościuszko also met and became close friends with Thomas Jefferson, for whome the Pole was “as pure a son of liberty as I have ever known.” They shared many views philosophically and politically, and Kościuszko often stayed for extended periods at Monticello. When the war ended in 1783, Kościuszko’s mind inevitably turned to his native Poland. Before he departed, Congress promoted Kościuszko to Brigadier General, and awarded him with citizenship, 500 acres of land, and $10,000 – a small fortune for the time. Kościuszko converted his American assets, awarded to him by the U.S. Congress, into a trust fund for the manumission and education of black slaves. The trust fund was administered by his friend Thomas Jefferson. Kościuszko arrived at his family estate in Siechnowicze in July 1784. Given his adventures in France and America, it should not have come as a great surprise when he decided to cut the obligations of his serfs in half. He would eventually leave his estate to his sister on condition that she set all their serfs free. In 1788, the Sejm Wielki (Grand Parliament) ordered the expansion of the Polish army to 100,000 men, and the following year, Kościuszko received a royal commission to Major General. On May 3, 1791, the Sejm Wielki finalized the world’s second modern codified national constitution, it being preceded only by the American Constitution ratified the year before. Sadly, it was not to enjoy the same longevity. The new constitution placed the peasant serfs under the protection of the government and aimed at creating equality between the nobility and the burghers by introducing a property requirement. Thus, it made property ownership, rather than birth, the main criterion of citizenship. Further, the monarchy became hereditary, government was strengthened, and theliberum veto, a system whereby a single dissenting member could veto any decision of the parliament, was scrapped. Russia reacted with fury. Along with several Polish aristocratic renegades, Empress Catherine II (the Great) formed the Targowica Confederation and launched an invasion to crush the reform movement. In May 1792, 100,000 Russian regulars crossed the border into Poland with the handful of renegades in their train. In the war that followed, which became known as the War in Defense of the Constitution, Kościuszko performed brilliantly but in vain. Assuming command of the 3rd Crown Infantry Division, Kościuszko played decisive roles in the Polish victories at Zieleńce, Włodzimierz, and Dubienka. None of these triumphs, however, had been conclusive, and even though Polish forces had yet to suffer defeat in the field, King Stanisław defected to the Targowica Confederation and surrendered to the Russians. Despite a promotion to Lieutenant General and the entreaties of the King, Kościuszko resigned and departed for Paris. The war culminated in the Second Partition wherein Prussia and Russia devoured a further 42 percent of Polish-Lithuanian territory. Poland was now reduced to 125,000 square miles and 4 million inhabitants. With the economy in shambles and faced with unrelenting foreign oppression, a conspiracy started forming almost immediately to launch an insurrection. When the time came to designate a leader in 1794, the choice was unanimous: Tadeusz Kościuszko. Kościuszko was given total command of the rebellion and with an army of 4,000 regulars and 2,000 peasants armed with scythes, inflicted a clear defeat on a superior Russian force at the Battle of Racławice. The Russians were far from finished, however, and despite the setback, they succeeded in forcing Kościuszko to retreat to Warsaw. This set the stage for perhaps Kościuszko’s greatest military achievement, where for two months his men held off a vastly superior Russian force, eventually being relieved by Polish reinforcements from elsewhere in the country. His freedom of mobility regained, Kościuszko received word that a second major Russian force had sacked Wilno in the Grand Duchy. Determined to make sure the two Russian armies did not combine, Kościuszko marched to Maciejowice. On October 10th the Russians attacked with a force almost twice that of Kościuszko’s. They pushed straight through a bog that was thought to be impassable turning the Polish right flank in the process. 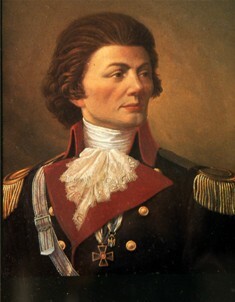 Kościuszko was wounded and taken prisoner and his leaderless army was defeated. The uprising struggled on for several more months but finally surrendered in the wake of the Massacre of Praga, where the Muscovites slaughtered the civilian population. Kościuszko was held captive in Russia for over two years, eventually being released by Czar Paul I under the condition that he never return to the Muscovite Empire (which then included former Poland). He would spend the majority of his remaining years in Switzerland fighting for the Polish cause. He spurned Napoleon’s advances for cooperation, for the Pole considered his former Corsican schoolmate a tyrant. While not successful in reestablishing an independent Poland, Kościuszko’s stature was such that he was invited to the Congress of Vienna. There he was courted by Czar Alexander I who imagined a new, albeit subservient, Poland led by Kościuszko. Not surprisingly, he flatly refused. A man of unwavering principle, Tadeusz Kościuszko passed away two years later in Switzerland. He is remembered in America as an adopted son and in Poland as one of its greatest heroes. Indeed, according to lore, his defiant statement when captured by the Russians, now forms the opening of the Polish national anthem, “Jeszcze Polska nie zginęła póki my żyjemy“, (“Poland has not perished yet whilst we live”).